This portal is manually maintained by Simon Burchell. Please contact these user(s) when you plan to make significant changes. Mesoamerica (Spanish: Mesoamérica) is a region and cultural area in the Americas, extending approximately from central Mexico to Belize, Guatemala, El Salvador, Honduras, Nicaragua, and Costa Rica, within which a number of pre-Columbian societies flourished before the Spanish colonization of the Americas in the 15th and 16th centuries. As a cultural area, Mesoamerica is defined by a mosaic of cultural traits developed and shared by its indigenous cultures. Beginning as early as 7000 BC the domestication of maize, beans, squash and chili, as well as the turkey and dog, caused a transition from paleo-Indian hunter-gatherer tribal grouping to the organization of sedentary agricultural villages. In the subsequent formative period, agriculture and cultural traits such as a complex mythological and religious tradition, a vigesimal numeric system, and a complex calendric system, a tradition of ball playing, and a distinct architectural style, were diffused through the area. Also in this period villages began to become socially stratified and develop into chiefdoms with the development of large ceremonial centers, interconnected by a network of trade routes for the exchange of luxury goods such as obsidian, jade, cacao, cinnabar, Spondylus shells, hematite, and ceramics. While Mesoamerican civilization did know of the wheel and basic metallurgy, neither of these technologies became culturally important. Among the earliest complex civilizations was the Olmec culture which inhabited the Gulf coast of Mexico. In the Preclassic period, complex urban polities began to develop among the Maya and the Zapotecs. During this period the first true Mesoamerican writing systems were developed in the Epi-Olmec and the Zapotec cultures, and the Mesoamerican writing tradition reached its height in the Classic Maya Hieroglyphic script. Mesoamerica is one of only five regions of the world where writing was independently developed. In Central Mexico, the height of the Classic period saw the ascendancy of the city of Teotihuacan, which formed a military and commercial empire whose political influence stretched south into the Maya area and northward. During the Epi-Classic period the Nahua peoples began moving south into Mesoamerica from the North. During the early post-Classic period Central Mexico was dominated by the Toltec culture, Oaxaca by the Mixtec, and the lowland Maya area had important centers at Chichén Itzá and Mayapán. Towards the end of the post-Classic period the Aztecs of Central Mexico built a tributary empire covering most of central Mesoamerica. Nahuatl (Nahuatl pronunciation: [ˈnaːwatɬ] ( listen), with stress on the first syllable) is a group of related languages and dialects of the Nahuan (traditionally called "Aztecan") branch of the Uto-Aztecan language family. Altogether they are spoken by an estimated 1.5 million Nahua people, most of whom live in central Mexico. All Nahuan languages are indigenous to Mesoamerica. Nahuatl has been spoken in central Mexico since at least the 7th century AD. It was the language of the Aztecs, who dominated what is now central Mexico during the Late Postclassic period of Mesoamerican chronology. During the preceding century and a half, the expansion and influence of the Aztec Empire had led to the variety spoken by the residents of Tenochtitlan becoming a prestige language in Mesoamerica. 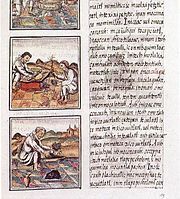 With the introduction of the Latin alphabet, Nahuatl also became a literary language and many chronicles, grammars, works of poetry, administrative documents and codices were written in the 16th and 17th centuries. This early literary language based on the Tenochtitlan variety has been labeled Classical Nahuatl and is among the most studied and best documented languages of the Americas. Today Nahuatl varieties are spoken in scattered communities mostly in rural areas. There are considerable differences among varieties, and some are mutually unintelligible. They have all been subject to varying degrees of influence from Spanish. No modern Nahuatl languages are identical to Classical Nahuatl, but those spoken in and around the Valley of Mexico are generally more closely related to it than those on the periphery. Under Mexico's Ley General de Derechos Lingüísticos de los Pueblos Indígenas ("General Law on the Linguistic Rights of Indigenous Peoples") promulgated in 2003, Nahuatl along with the other indigenous languages of Mexico are recognized as lenguas nacionales ("national languages") in the regions where they are spoken, enjoying the same status as Spanish within their region. Matthew Williams Stirling (August 28, 1896 – January 23, 1975) was an American ethnologist, archaeologist and later an administrator at several scientific institutions in the field. He is best known for his discoveries relating to the Olmec civilization. Stirling began his career with extensive ethnological work in the United States, New Guinea and Ecuador, before directing his attention to the Olmec civilization and its possible primacy among the pre-Columbian societies of Mesoamerica. His discovery of, and excavations at, various sites attributed to Olmec culture in the Mexican Gulf Coast region significantly contributed towards a better understanding of the Olmecs and their culture. He then began investigating links between the different civilizations in the region. Apart from his extensive field work and publications, later in his career Stirling proved to be an able administrator of academic and research bodies, who served on directorship boards of a number of scientific organizations. An eccentric flint is a chipped artefact produced by the Maya civilization of ancient Mesoamerica. Although generally referred to as "flints", they were typically fashioned from chert, chalcedony and obsidian. Eccentric flints were manufactured by specialist artisans in lithic workshops for non-utilitarian purposes and were sacred high-status objects associated with Maya elite power. ... that the ruins of the Maya city of Mixco Viejo (pictured) in Guatemala received their name because they were believed to be the remains of another city entirely? ... that the Mesoamerican archaeological site of Quelepa in eastern El Salvador was distinguished by its unusual ramped pyramids?